French fries are a universal comfort food…both to kids and adults alike. The only way some of us stay away from them is the knowledge that they aren’t the healthiest of foods. But with this alternative – there are no excuses!!! While oven preheats, combine the bread crumbs, parika, and salt in a small mixing bowl. Set aside. Cut avocados in half vertically and remove the pits. Carefully slice each avocado half vertically down to the peel. Using a large spoon, scoop the avocado slices out of their peels. 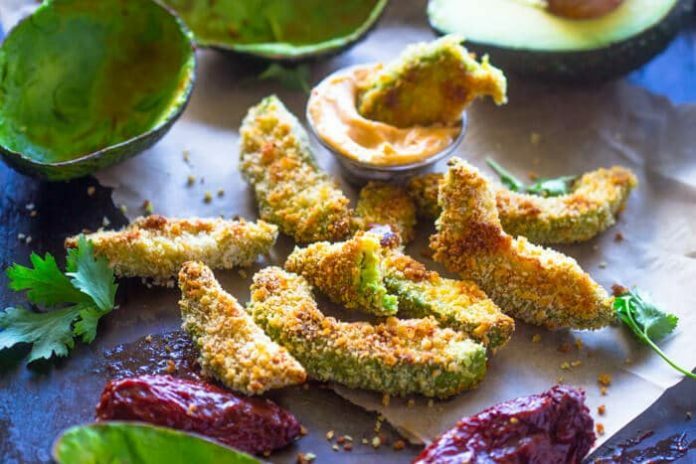 Brush each avocado slice with a beaten egg and coat in bread crumbs (repeat process for a thicker coating). 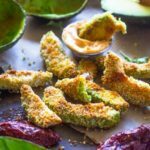 You may also dip avocado slices in a bowl with the eggs, then roll them in a plate with the bread crumbs. Place avocado slices in baking dish (or baking sheet covered with a versatile, non-stick silicon baking mat) and drizzle olive oil on top. TIP: Add a sprinkle of fresh lime juice to preserve the avocado color while baking. Bake for 12-15 minutes at 450°F or until golden brown. Serve and enjoy with your favorite dipping sauce.